There were a few Director users who made the trip to Las Vegas for this year's Adobe MAX conference, which was held at the lovely Venetian. 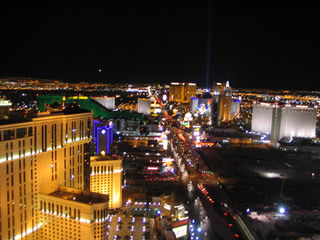 I personally decided to make the drive to Sin City rather than deal with all the issues with travel these days. Plus, it let me make a short trip the Atomic Testing History Museum located a few blocks off the strip. The conference opened with the traditional welcome reception, this time held pool side at the Venetian. A nice improvement from the usual exhibit hall setting. I was able to locate Jason MacDonald from Integration New Media. It was nice to find another Director user among the 3,500 attendees. It was later mentioned that this was the largest MAX to date. We kept an eye out for any other familiar faces, but none were to be found. After the bar closed, Jason and I head out on to the Strip in search of some food and drink. Tuesday kicked off with the opening keynote. Since this is Vegas, there has to be a show. So, enter Blue Man Group... I'm glad we were not at Caesar's Palace, we might have gotten Celine Dion! This certainly got things moving. Kevin Lynch served as our master of ceremonies for the keynote. First up :Shantanu Narayen, Adobe's COO. He presented a short film on the marriage of Adobe and Macromedia. This was the first MAX since the merger. Last year, things were still being finalized, so a lot of folks had to be quiet on the plans for the future. I spoke with several old Macromedia friends about how things are going. They all said it was going pretty good. He introduces a Flex based application on Adobe Labs, Adobe Digital Editions. It is designed to read and manage eBooks. I could not wonder if five years ago if this would have been a Director based application? One major theme of the conference was demonstration improved workflows between the products. For example Flash 9 will adopt some UI elements from Photoshop. The whole tabbed palette lawsuit nonsense can be forgotten, and better UI's across all the products should emerge over time. During the look back, Director did get a minor mention as being part of the pantheon of products. That's right, "respect" your elders you young whippersnappers! Flash Lite is running a 100 million devices worldwide. Kevin return to the stage to highlight some of the Flash penetration numbers. Flash Player 9 is following the same curve as Flash 8 in adoption rates. 80% penetration in about 9 months is predicted. With the new virtual machine, FP9 should allow for real work to be done by Flash. The Flash Video revolution was also highlighted. When FP8 shipped, video on the web exploded. Greg Rewis demonstrated a future workflow for web design. They showed a flow to quickly add interactivity to website prototypes for client review. Photoshop comps were brought into Fireworks (keeping everything intact), some simple "go to layer X" functionality was added. This was brought into Dreamweaver to create the HTML. Dreamweaver will now be able to reach back to Photoshop for editing updates. SPRY integration was demonstrated inside of Dreamweaver. Other goodies: Photoshop will have docked panels and the ability to collapse these panels into iconic versions. Click on an icon and the panel will fly back out. 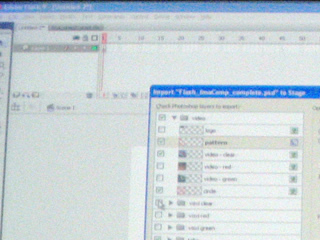 For the video production workflow, After Effects integration with Flash and Flash video was showcased. Flash was also shown to be able to import PSD files, recognizing layers, type, and filters. Photoshop filters were translated into Flash Filters. Layer visibility is kept intact, text can be editable. Soundbooth was one the big announcement of the day. SoundEdit Lives! They mentioned that this was an area long forgotten, so they sought to develop a tool for the non-audio folks who have to work with sound. The UI is task based, so it is designed to aid the user in adding audio effects, audio creations (ala Garageband), and audio clean up. It is up on Labs. One big note is does not run on PPC. several demos were done on Intel based Macs, but nothing was said about this by the presenters. In fact, several Window demos were actually done via Parallels. Sho Kuwamoto demo'ed using Illustrator to build a skin for use in Flex, then connect the resulting swf to ColdFusion. Flex Builder is finally available for the Mac in Beta form. Also on Labs. I'm playing with it quite a bit in my spare time. I wish Director's editor was a rich and useful as Flex Builder. If you are ColdFusion junkie, I'll let you wander over to Ben's blog to learn more from that end. But PDF integration was another theme during the conference. This certainly was of interest to Jason and their PDF tools for Director. The other big demo was Apollo. Was this the feared Director Killer? 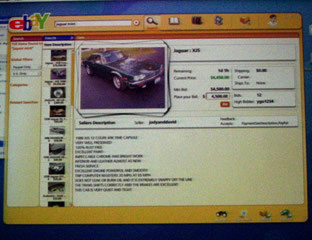 Several demos were shown, one for a eBay tool and another for MySpace that was an IM tool. Oh, and they formed a venture capital fund to the tune of $100,000,000 for Apollo development. Information is online. The demos were done on Mac, so that is good news. Is it a Director killer? Hum, not quite but one should keep a close eye on this effort, since it does overlap into a lot of the existing market space of Director. The main focus on day 2 was on the mobile world. The Verizon Guy was there, as the stage rotated around revealing him, behind him was a slew of Adobe folks, including John Dowdell, some from the Flash Team, and others. The quick summary was that finally, the USA was getting phones that use Flash Lite 2.1 for Brew. (Adobe/Verizon/Qualcomm partnership was announced as well). Several Abode tools were updated to support the mobile world. Flash has a mobile emulator, but Photoshop now has the ability to save PSD's with a Save As for web and Mobile. This will allow you review how environmental factor impact the artwork (daylight, night time, etc.). This continued the theme of improved workflows. It also appears that the mobile emulator in Flash, appears to been broken out into a stand-alone application. Some embedded Flash players were also shown, such as Chumby (a smart alarm clock device) and the PS3. The Brew ecosystem was outlined. Since there is a certification system required to sell content through the Verizon network, Adobe has partnered with Atom Films (hum, didn't they have something to do with shockwave.com ?? ), FunMobility, and Smashing Content. A demo of the process was shown, a publishing wizard for Brew was shown and should be available on Labs. What would a MAX be without a PARTY! 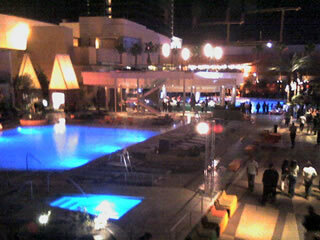 So we all headed on buses to the Palms hotel. The evening was bit windy, so it made hanging out by the pool a bit chilly. Drink, food and music were to be had in the three surrounding clubs. Jason could not join us since he had to return to Canada, but Raman Pfaff and I trolled about the party. As luck would have it, we ran into the new project manager for Director and the lead engineering manager. The four of us chatted about the future of Director, it uses and what our vision was for the tool to continue. Some of the issues that we spoke about were future platform support (Vista, Intel-based Macs), support for Flash Player 9. We all agreed that one advantage/problem with Director is that is so many things for so many people. We also talked about the challenges of coming up to speed on the code base that is Director. This made the conference with it for me. Sorry, we weren't able to get any hints on when a new version might appear. I would venture a guess it will be a bit as the team unravels the legacy that is Director. Yahoo! IM shown with a Flash-based plugin that will allow a meeting to be launched. PDF support in meetings was also shown. The new version is named Scorpio. In classic Coldfusion quirkyness, Ben Forta was dress as Scorpioman. The demo'ed some server usgage inspection tools. If you are into Coldfusion, I would say wander to your favorite Coldfusion blog to learn more. This audio editor was built in the spirit of SoundEdit 16. The main point that jumped out to me was the fact it was very task-centered. I do a lot of task-centered design, so seeing this design pattern in the real world, is cool. The interface appears very easy to grasp. The big issue is since this is a new application, there is no PPC support. Oh well for me. I do understand the engineering issue. It just makes me want a MacBook Pro even sooner. They demo'ed sound isolation of a squeak in a file, switching to the visualizer mode, locate the squeak. You can play just the selected region of the spectral view. Very cool. It also has some Garageband like functions that enable you create music. It is up on Labs, so check it out. It's not dead? The overall theme of the demo was creating a tool that focused on interactive elements. Flex components are a integrated, so mockups will be easier. Support for 9-Scale was also shown. 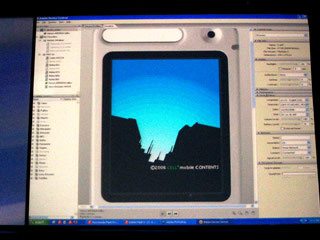 Exporting the design UI as MXML was also shown. They reshowed the multiple view capability for client review. Might need to look at the tool again in the near future. It is currently in a private beta. The debugging functionality looks to be improving. Not to the level as Director's debugging, but you can now see errors in the Compiler Errors panel. Items like location, description, source are shown. Double-clicking the error will bring up the line. You can click the next error button, and the next error will be selected. Another item was associating a .AS file to a target FLA. this should allow for faster testing, since you will not have to find the root AS file, and recompile it to test the changes in an related AS file. A new debugger was also showcased. This looks to be a big improved over the past. Integrated CSS Advisor tool. This works with various online resources to provide expert help to solve those tricky CSS issues. Something new this year was some non-Adobe sneaks. A Flex and SAP demo was given from Geoffery Cubitt from Roundarch. This was a customer support application. Beau Amber of Metaliq did demo of some new components for Flash 9/Flex. The speed of these AS3 based components was awesome. He demo'ed a lighting fast datagrid. I am sure a lot of this will be exposed into Apollo. But Director's 3D edge might be slipping. I wonder if I can integrate a PDF in Apollo with a 3D element embedded??? 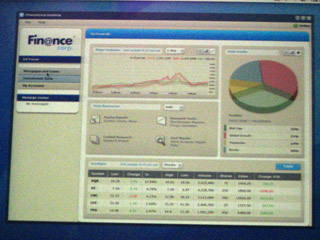 The final demo was Apollo application that is being developed by CommuniGate Pronto!. It showcases email, calendar, contacts in a single pane UI. It is port of a Flex based application they had developed and transferred into Apollo in a short amount of time. Although there was no real Director elements at this show, meeting some of the new team members was a real plus. The Apollo project looks to be a real interest to the me and the rest of the Director community should take notice if it as well. AS3 and it's performance gains likewise are items of interest. Starting with a MacSE (now a MacAquarium), Chris has been working with Director since version 3 and continues to explore the uses of multimedia. He is currently an engineer at Pacific Science & Engineering Group, Inc., a company specializing in human factors research and development. He has developed DVD, CD, and Shockwave projects for such clients as Presto Studios, The Coca-Cola Company, J. Walter Thompson, and the United States Marines Corp. Chris can be reached at cgriffith@pacific-science.com when he is not kayaking in the Pacific Ocean or playing with his 6 year old twins.